Swarovski delivers classic elegance with this necklace and earrings set. 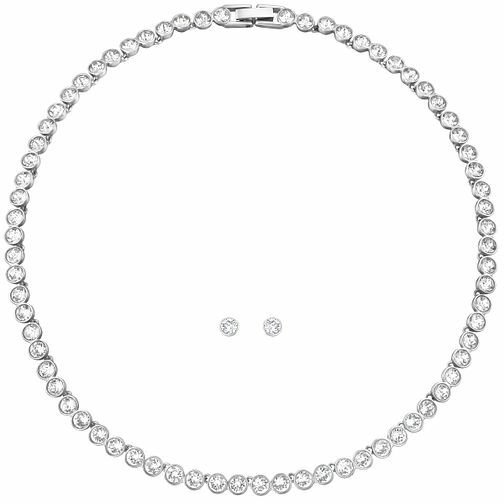 A simple tennis necklace set with glistening white crystals and a hinged clasp comes complete with matching stud earrings. Swarovski crystal tennis necklace & earrings set is rated 4.2 out of 5 by 5. Rated 1 out of 5 by Anonymous from Poor quality I was very disappointed in the quality of this necklace considering the cost. I also found it too tight to wear comfortably. It was returned. Rated 5 out of 5 by Anonymous from Excellent Excellent service and quick. Very friendly staff at the shop.